The Wausau Region Chamber of Commerce invites you to enjoy our Central Time publication which uncovers why the Wausau Region is the place to work, play and live in the moment. In the Wausau Region you are in a whole different zone. Wisconsin Central Time is about living in the moment. It's not just about living to work or working to live, but about living fully; about enjoying the kind of balance that allows you to approach every day with heightened anticipation. 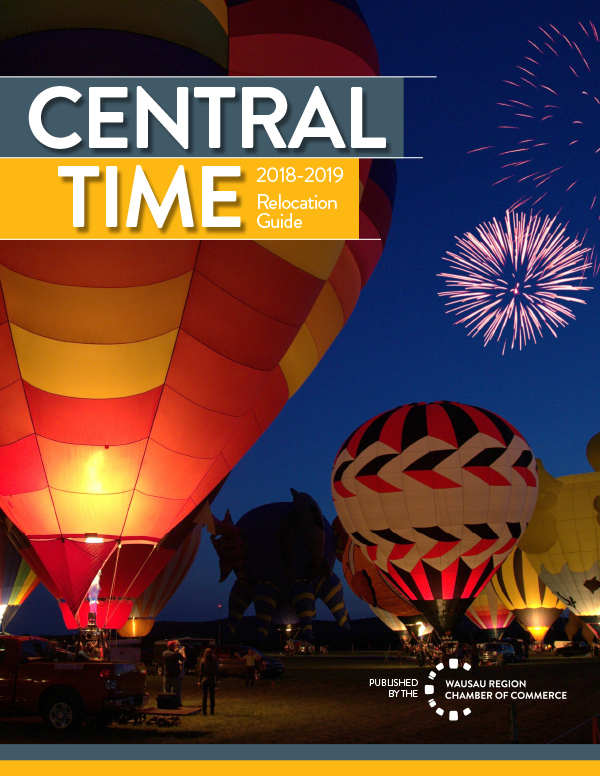 The Wausau Region Chamber of Commerce’s annual Central Time publication is part of an ongoing effort to attract both people and businesses to our region. As a member of the Chamber, we encourage you to use this guide as a resource within your organization and as an employee recruitment tool. Some of the topics highlighted in the edition will include: business, education and schools, healthcare, recreation and the arts. The printed magazine and interactive online publication promotes the Wausau Region to individuals and families relocating to the area. It also highlights the talented people who have moved here and the outstanding amenities that make our region one of the best places to live, work and play. View more videos on the Wausau Region Chamber of Commerce YouTube channel.